As far as I know we're not kin to ANY Youngs. My Daddy always told me he thought we used the name Young because the Yonges founded Abbeville and Geneva. The Yonges were descended from the Indian traders with Panton, Leslie & Co. There are Young Registers all over the place. They go all the way back to the "old country" (Darlington, S.C. ~ The Cheraw District). So that's our Young connection. Nothing but a fambly tradition. Oh yeah. I got the death dates on some of those cats who were captured with my Uncle William Duncan at Island #10. At Camp Randall in Madison, Wisconsin, members of Geneva's Gulf Rangers died on May 22, 1862; May 23 or 24, 1862; June 21 or 29, 1862; May 29, 1862 and May 23, 1862. One of the guys at Camp Randall was a Register but I don't know how I'm kin to him. There was a Peacock died there too. I have read reminiscences from Camp Randall. Almost every one of those boys were from Alabama. They had pneumonia so bad that phlegm covered the floors of their hospital.You'd slide down if you weren't careful. They were all clothed in cotton. No wool. They saw the spring bloom four times. They saw it bloom in Pensacola as they prepared to go up the Mississippi. They saw it bloom at Island No. 10 above Memphis. They saw it bloom while captive in Illinois and they saw it bloom at Camp Randall in Wisconsin. Their cemetery is the northern most Confederate cemetery. Uncle William is buried in the Camp Douglas mass grave in downtown Chicago. Pretty sure there's 6000 buried there and it wasn't even marked for 35 years. Dat showl do makes you feel all warm and fuzzy for yo' govmint now don't it! Uncle William died July 13, 1862. G-Great Grandpa Register filed a claim with the federal government for killing him on August 3, 1863. Other boys from Geneva died on May 14, July 11, July 7 and July 13, 1862. "Being a lawyer is not a profession. a life style of knocking people loose from their money." He also said that he loves to defend guilty clients because he can get over half of them off and can charge the crap out of them. He said that he can confuse any jury. Big Jim Folsom tried to pass a bill to prevent lawyers from holding state elected offices. Of course he got no where with it. I told a law professor friend of mine that he trains people to hide the truth or reveal the truth according to which side the money is on. He just had a blank look on his face and finally said that that might be true but that was not his intention. it's very much like what a salesman does when he makes his sales presentation and tries to close the sale." A law professor jumped up and said "No it's not, he's a layman and he doesn't understand", referring to me. He was wrong of course and I was exactly right and that's part of the problem, the judicial system is a closed club and will punish anyone who tries to expose it. are conspiracies against the public". a beer joint in Box Springs. I was about 14-16 years old at the time. I would drive them home if the beer got to them a little heavy. I had learned to drive at age 10 in a 40 ford that had no brakes. I still don't trust brakes even on a new car. Anyhow Bascom Estes, the mom's boy friend, would take down the serial number of a 1 dollar bill. Dialing for dollars was big around that time for ner-do-wells like us. Bascom got his feet frozen in northern Itlay in WWII with the US Army. Bascom would pay for beer at some point with that dollar bill as the evening went by. Some time later Bascom would pull out the paper with the serial number he had written on it and ask Bill Hocutt, the owner of the Barn, if he might have a bill with that number on it. a Dialing For Dollars' prize. Bascom would eventually disclose the joke. The whole bar would break up and Hocutt would threaten to throw us all out. The Barn also had white lightning under the bar. Bill Hocutt had a brand new 57-58 orange and white Edsel parked in front of the Barn. and a .75 cent all you could eat lunch and dinner with big pots of all kinds of good ole country food on a big long table that could seat about 15-20 people. There's a beauty shop at that location now. Ma Philips' place burned down years ago. There was also a joint called The Red Elephant there at Box Springs in the fork of the road. The old Highway 11 ran through Box Springs and a street turned and went over the rail road to the VA and 15th street. A side note, Bascom Estes' grandfather was a blacksmith in the 1860's in the area where Reform,AL. is. He was enslaved to shoe Union troop's horses at the end of the civil war. He had a choice of either be hung or shoe horses according to Bascom. Of course he chose to shoe horses. I just thought you might enjoy some of this disjointed babble. Mrs. Booth ,a very nice hard working lady, owned and ran the Oasis and we went there at times as well as to Bucksville and Columbus. Mrs. Booth had 2 beautiful daughters who would come to the bar to help their mom at times. We would do ignorant teenage lusting. And Mamie said, "I'll just get him a can of sardines and a spoon and he'll never know the difference". Thanks for the memory jogging Roberto. Oh yes, the Jungle Club was running about that time. It was located where Advance Auto Parts is at 5 points is. It was a fun place. In later years,early to mid 60's, there was this Alabama star quarterback from Pennsylvania who got in fights there a lot. I never saw those fights but heard a lot about it from the owner Dan what's his name. This quarterback loved to drink & fight according to Dan and the police would not arrest him if they were called or happened by. This quarterback was your classic thug according to witnesses. I must have bored you to tears by now so I'll shut up. Take care and keep the Time Warp Express going. The Web continues to amaze me. Most residents of ZERO, NORTHWEST FLORIDA know that every four or five months I google my ancestors to see if something's new posted on the Internet. Last May I discovered a mail contract my G-Great Grandfather John Young Register had to carry the mail from Geneva to Monticello, Alabama, once a week. That was over a 140 mile round trip in 1858. Well, tonight I found three more contracts that G-Great Grandpa received in 1857. He submitted three low bids to carry the mail. He won so many contracts that he had to have hired other men to help him. He bid $600 per annum to haul the mail from Daleville to Andalusia, 58 miles, and back, twice a week. He had to have a man leave Daleville with the mail Tuesday and Friday at 1 P.M. & arrive at Andalusia the next day by 6 P.M.
On Monday and Thursday he left Andalusia at 6 A.M. and arrive at Daleville the next day by 12 noon. G-Great Grandpa Register bid $170 per annum to carry the mail from Newton to Geneva, 30 miles and back, once a week. He had to have a man leave Newton Friday at 7 A.M. and arrive at Geneva by 5 P.M.
On Tuesday he had to leave Geneva Tuesday at 7 A.M. and arrive at Newton by 5 P.M. The third contract I found was to deliver the mail from Skipperville to Newton, 20 miles, and back, once a week. His winning bid was $125 per annum. This contract stipulated that the mail had to leave Newton Saturday at 6 A.M. and arrive at Skipperville by noon and then make the return by leaving Skipperville at 1 P.M. and arriving at Newton by 7 P.M. Definitely a full days work. I'm pretty sure that Skipperville was on the Ft. Gaines to Pensacola Road. Monticello was on the Columbus to Pensacola Road and both of these roads merged in Andalusia. He had more than three contracts because I found where he was fined for not showing up in Greenville 6 times and missing Elba 5 times in January and February of 1858. He got fined $22 for missing his Greenville deliveries and was deducted $19 for missing Elba's. I have no idea about the road from Elba to Greenville but I know there was a good road from Greenville to Pensacola because the Spanish Colonial Records from before 1821 were first taken to Greenville by the Confederates after the Yankees occupied Pensacola early in the Civil War. Well, imagine my surprise when I also found out during my googling that there's a famous painter named John Register. Well I already knew there was one important artist named John Register. He's my son & his full name is John Christopher Young Register & I recently published the first rock poster he composed for the band Shrapnel Petals. 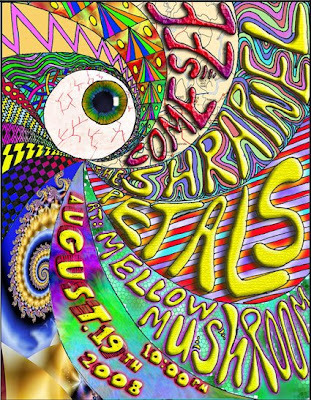 THIS IS FIRST ROCK CONCERT POSTER Christopher ever designed! I wish I had come across this painter a long time ago. A friend of mine from Riverside recently told me about this California artist and his work blew me away. He captures something in California like John Fante captures L.A. Hopefully next time I'm in the States I can see this guy's work in person. John Register (1930 - 1996) was not just another realist painter. This former race car driver quit his successful job as a New York City advertising executive one afternoon in 1972 and never returned to the office. Instead, he dedicated the rest of his life to his one true passion - painting. Beginning July 2, 1999 the Frye Art Museum hosts the first comprehensive retrospective of this unlikely artist's work. Organized by the San Jose Museum of Art, this exhibition is the first major showing of Register's work, which has often been compared with that of Edward Hopper. Culled from private collections throughout the United States, the retrospective includes paintings and other works on paper. The exhibition is accompanied by a full color hard bound catalogue "John Register: Persistent Observer" by Barnaby Conrad III. 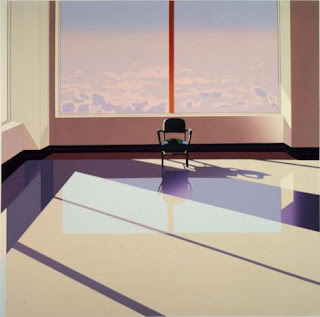 John Register was a major California realist painter, best known for his sunlit paintings of cityscapes, waiting rooms, storefronts, and coffee shops. Born in New York, Register studied at the University of California, Berkeley, and the California School of Fine Arts in San Francisco. As a race car driver he set a number of course records throughout California in the early 1960s, driving his beat-up Porsche Speedster against such rivals as Lance Reventlow and actor Steve McQueen. He studied at Brooklyn's Pratt Institute, founded by his great grandfather, Charles Pratt. He later studied with portraitist Everett Raymond Kinstler and landscape painter Lennart Anderson. Register painted the beauty and the art in the everyday: a semi-truck on the highway, a stop sign, draperies flapping in an open window or empty chairs and diners. Human beings are rare in his work. Register chose these subjects because, "they are something we experience universally, a kind of denominator of interior space." The artist was noted for his ability to capture the atmosphere, light, and stillness of unlikely scenes, creating a distinct sense of place. Despite struggles with life-threatening illnesses during the last fifteen years of his life, Register continued to paint prolifically until he succumbed to cancer in 1996 at the age of 57. His legacy stressed the overlooked beauty in unpeopled places. After Seattle, the exhibition travels to the Palm Springs Desert Museum in California, the Frederick R. Weisman Museum of Art in Malibu and the Sun Cities Museum of Art in Arizona. new exhibition by realist painter John Register (1939 - 1996) will open at the Palm Springs Desert Museum on Wednesday, September 22, 1999.
is a provocative collection of hauntingly seductive images by one of the most distinctive realist painters of his generation and runs through November 28,1999 in the Museum's Annenberg Art Wing. 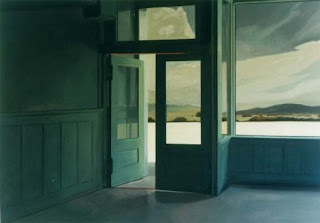 Often compared with Edward Hopper, Register has explained, "With Hopper you witness someone else's isolation; in my pictures, I think you, the viewer, become the isolated one." Born in New York and educated at the University of California at Berkeley, John Register was influenced by the Photo-realist artists Richard Estes and Ralph Goings. However, unlike these painters, Register used photographs merely as a starting point - an armature - for his work. This exhibition is accompanied by a 192-page full-color book by Barnaby Conrad III, a longtime personal friend of John Register's. has been organized by the San Jose Museum of Art. The Palm Springs showing and educational programs are funded in part by the Museum's Artists Council. Please Note: RLM does not endorse sites behind external links. We offer them for your additional research; external links were chosen on the basis of being the most informative online source at the time of our search. Read more about the Palm Springs Desert Museum in Resource Library Magazine. Received word today that Buddy is now out of ICU and has his own room. Now that's what I call PROGRESS!!!! Thank y'all so much for your "GET WELL WISHES". The big scandal on Sara on the Daily Kos TODAY is that she's a SECESSIONIST! When I was about to go off to The University, Daddy had a heart-to-heart with me. "I don't know anything about that university. Never stayed there, never attended a class but I've been to Tuscaloosa. Son, promise me one thing. Don't make a lawyer. This family can't afford to have a paid liar." why so many physicians are conservatives or Republicans. Bill Frist is a heart surgeon. lawyers always parse language to favor their side. us a great deal of freedom from laws, from courts, and from lawyers. modest and reasonable, not vast and unchecked. moral values or spark the spirit of enterprise in our economy. Martins, like all swallows, are aerial insectivores. They eat only flying insects, which they catch in flight. Their diet is diverse, including dragonflies, damselflies, flies, midges, mayflies, stinkbugs, leafhoppers, Japanese beetles, June bugs, butterflies, moths, grasshoppers, cicadas, bees, wasps, flying ants, and ballooning spiders. Martins are not, however, prodigious consumers of mosquitoes as is so often claimed by companies that manufacture martin housing. An intensive 7-year diet study conducted at PMCA headquarters in Edinboro, PA, failed to find a single mosquito among the 500 diet samples collected from parent martins bringing beakfuls of insects to their young. The samples were collected from martins during all hours of the day, all season long, and in numerous habitats, including mosquito-infested ones. Purple Martins and freshwater mosquitoes rarely ever cross paths. Martins are daytime feeders, and feed high in the sky; mosquitoes, on the other hand, stay low in damp places during daylight hours, or only come out at night. Since Purple Martins feed only on flying insects, they are extremely vulnerable to starvation during extended periods of cool and/or rainy weather. Got a call from Buddy Buie today and he gave me permission to let everyone know about his situation. Buddy never wants anyone to feel sorry for him or to consider him an invalid but unfortunately Buddy is suffering from serious heart disease and the only alternative was open heart surgery. On Thursday, August 21, Buddy underwent open heart surgery at one of Emory's hospitals. He had three coronary bypasses, a valve replaced with a pig valve and multiple surgical ablations. Buddy's heart got a complete overhaul. He has been in intensive care for the past thirteen days and he's still there. The last thing in the world Buddy wanted to do was to share this kind of news with y'all but, with his permission, I think it's best that you know. Please visit the YouTube clip of Buddy & J.R. bass fishing last year near Livingston. & leave a nice message. He'd love that. We all look forward to Buddy's full recovery and the return of this creative genius who many of us know as a true friend. THE WINNER OF THE RYAN:THE MOVIE CONTEST WILL RECEIVE A RYAN/LURLEEN PRIZE PACKAGE FROM ZERO, NORTHWEST FLORIDA! Here at ZERO, NORTHWEST FLORIDA we need all the help we can get in order to get our message out over the Internet. Sometimes that ain't easy seeing as how we are sometimes controversial and folks think twice before they start plastering our site on their page. I have no statistics on how many people are referred to our site by other websites but I don't think it's too many. The good news is that thousands of people use ZERO, NORTHWEST FLORIDA to find what they want on the Web. The Alabama Blues Society publishes their visitor statistics on the Web. 1628 people used ZERO, NORTHWEST FLORIDA to find THE ALABAMA BLUES PROJECT WEBSITE. WE WERE THE #1 REFERRER! #2 was google search with 522 referrals and #3 was google images with 252 referrals. than used google search or google images. We appreciate all of your support and hope to see you Friday night at ALABAMA BLUES FUNDRAISER at the L&N Train Station here in Tuscaloosa. Our buddy in Hollywood, Lance Miccio has a new film project concerning baseball in Japan. Here's a pretty good video of REDD cutting her new record at Playground. It gives you a good idea about their facilities. HOW 'BOUT DAT CRIMSON TIDE!!!! The entire crowd at the new Houndstooth on the Strip jumped up into the air when Julio caught his first TD pass while wearing Crimson. That was one precious moment in time! includes an January '62 image of a 17 year old "JIM FROM TUSCALOOSA", star of stage, screen & THE FINEBAUM SHOW! Tune up & oil them chainsaws 'cause you gonna needs 'em next week! There's a really good article on The Big Lebowski in the current issue of ROLLING STONE. Check out the video of Jeff Bridges in his DUDE sweater. I feel eminently qualified to discuss THE BIG LEBOWSKI seeing as how I'm the same age as Jeff Bridges & I own a DUDE sweater plus I like to cuss a lot, too. This weekend I went into a BIG LEBOWSKI FRENZY! and I watched a ton more clips & they were all funny & I love THE DUDE'S style. Reminds me of living the life of Riley in my own little groovy hippie pad/Sixties love shack on University Boulevard in old Tuskaloosa. Well imagine my surprise when I looked on Yahoo news this weekend and read this scathing criticism which trashes the lifestyle that both THE DUDE & I have grown to love and cherish over the past 40 years. The book is called GUYLAND & it's written by mind-numbed robot sociologist. & he's written a book that criticizes the way guys live today. This moron is a poster child for ACADEMIC SHITHEADS. Thank God in Heaven Bama dissolved its sociology department so the only alternative the sociologists in Tuscaloosa had was to commit suicide. They certainly couldn't do anything else. Tell Doc Kimmel to remember a Guyland man don't need him around anyhow! I've been spending some time going through the Pake Realty Company Archives & I have unearthed some gems I wanna share with you. LET'S PRAY FOR EVERYBODY WHO'S STILL LEFT DOWN ON THE COAST.